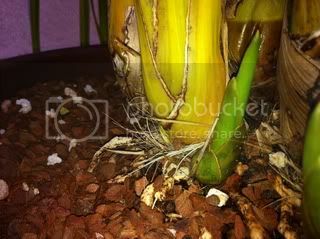 Cym flower spike or growth ? I thought this thread would be good for showing our Novice members just what a flower spike looks like and what a new groth looks like. All questions and pics can go into this thread. 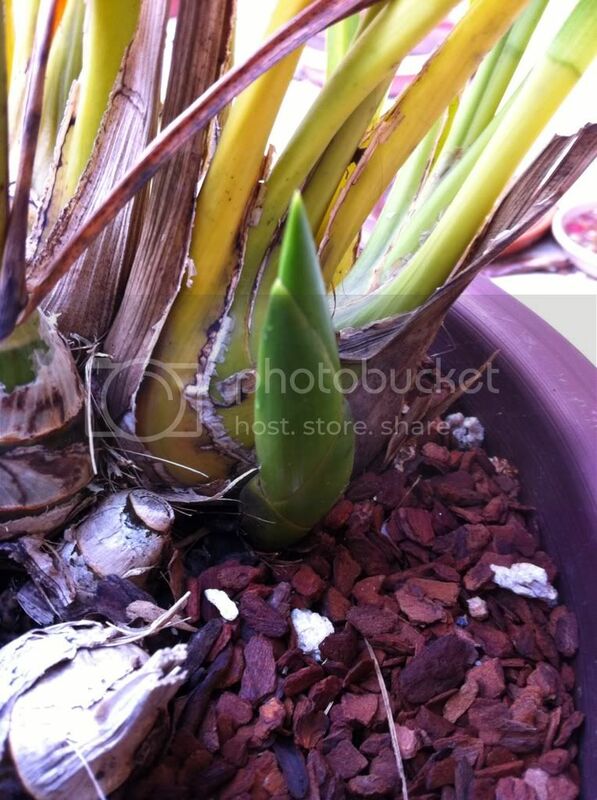 The flower spike and new growth look so similar. I hope I will be able to distinguish between the two if my cymbidiums flower next year. Someone told me that they need to be kept outside in the fall right before the first frost in order for the orchid to initiate a spike. Yes, siriusmk, initially a cymbid spike and growth look very similar. 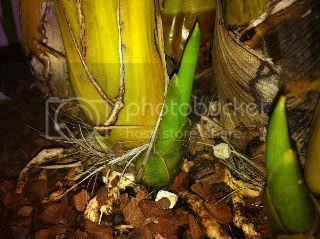 I have a friend who has probably 150 Cymbidiums who jokes that half of the spikes he stakes turn out to be growths not spikes at all, then he has to go around and pull out half the stakes he's put in. I can say that for my Cymbids, after a few weeks a flower spike starts to fatten out towards the tip as the buds start to fatten up inside the sheaths. At this point it becomes much easier to tell the difference. Thanks Fred! I have lots of new growth (lots being 2-3 per plant). I know they need to go outside, but Colorado weather is extremely unpredictable. How long to do they need to go outdoors for - weeks, months? I will let some of our US members answer that question for you as my cyms are outside in an green house. So my orchids only get watered and air movment from me. There's a squeeze test too, I find that quite accurate. When you gently squeeze a spike, it is very firm, whereas a new growth feels spongy. BUT don't squeeze hard ! I wouldn't dare trust myself to gently squeeze a Cymbid spike. i had the exact same question a week ago , thank u for demonstrating with pics! yea, the squeeze test is very effective. I just tried it. Now what do I do with the piece in my hand? All my plants are putting out new growths. Some even 5 or 6 , each. I don't want to post some photos showing robust growth since it may be boring . LOL pikevi - that was funny! I needed a laugh. I was told that the new spikes when they come up are round, and that new growth is flat. I shall state here that that is a fallacy, more than half of my round new "spikes" are in fact new growth, but hey, all the flat new growth is indeed new growth. I don't know where the round spike bit came from, all of my spikes and new growths look exactly the same when they first emerge, then as they lengthen, after a few weeks, those that are spikes start to swell or fatten-up towards the tip while those that are growths stay very thin and pointed. That's how I tell the difference. The only draw back is that I have to wait about another 2-3 weeks after I first spot them before I can tell what they're going to be. I got all that fabulous info from an orchid club I used to belong to. It was fun, but when we moved I had no orchids anymore, so stopped going to the club. Now that I am ready to join again the club has also moved to a new location, a bit too far for me to travel. Pity that. Talking of new spikes..... I broke one off accidentally, cry..
Ah well, there is one flower-spike left, and I shall post a piccie as soon as I have taken one. In the nice climate we have in the San Francisco bay area, the cooler the fall, the better the bloom. I figure that if they get a nice stretch of night time temps below 50, generally in sept, then they will bloom better for me. This year its been a cool summer and fall and I already have spikes on a couple of plants. I am hoping that this will be a banner year for cym flowers. Last year we had a hot summer & warm fall. My cym's didn't bloom well at all. I would think that it might be getting a little late in CO to leave them out overnight very often. I think a week or two of cool weather would be enough get the plant to set spikes. Thanks Hummer. I've had them outside for 2 weeks and then it dropped below freezing. They have now been moved to the garage. I'm debating putting them back outside again but our temps have been all over the place. Highs in the high 70s and Lows in the 30s and 40s. (Farenheit). I grow my cyms outside all year and last winter we got down to the high 20's overnight for several nights in a row. My cyms did fine. I had them grouped closely together under a tree. Lots of new growths this summer; I don't worry about them anymore. I didn't know it got quite that cool in Orange County. Learn something new every day! I'm a nervous nelly about orchids outside in Colorado, but hey, it's worth a shot. I sure won't see them spiking if I keep them in my atrium year round, right!?! Vivienne- Cyms grow great here with a temp variance of 30-100 degrees. Best part is, it only seems to be winter at night!! It will be 70-80 during the day, and 30 that night. Of course we all think we are going to die. It's not the usual, but we get several stretches of 30's at night during the winter. Cyms just thrive in it. Anton, your squeeze test seems to give different results than mine. I've noted, if firm, it is a growth, and if the tip collapses, it is a spike, because the flower buds are blunt, leaving the pointed tip empty. Maybe we are testing at different stages of growth. Yes, I agree. Cymbidiums love the cool nights. Although in my area if the temp. drop under 30 degrees in the winter, I will put up tarps to block the wind and having them against the wall of the house helps. Sometimes I also cover them with plant blankets as well. This year my cymbidiums are doing much better than last too. I divided almost all my Cyms. last summer and most are blooming now. Once the growth is about 4cm (1.5inches) long, if you gently squeeze the tip and it feels hollow - it's a spike. It almost feels like a pea-pod as you can feel the rounded buds underneath through the entire length of the spike.Now a slightly more pressing question... Sydney has had so much rain that some of my spikes stop growing and rot from the inside! 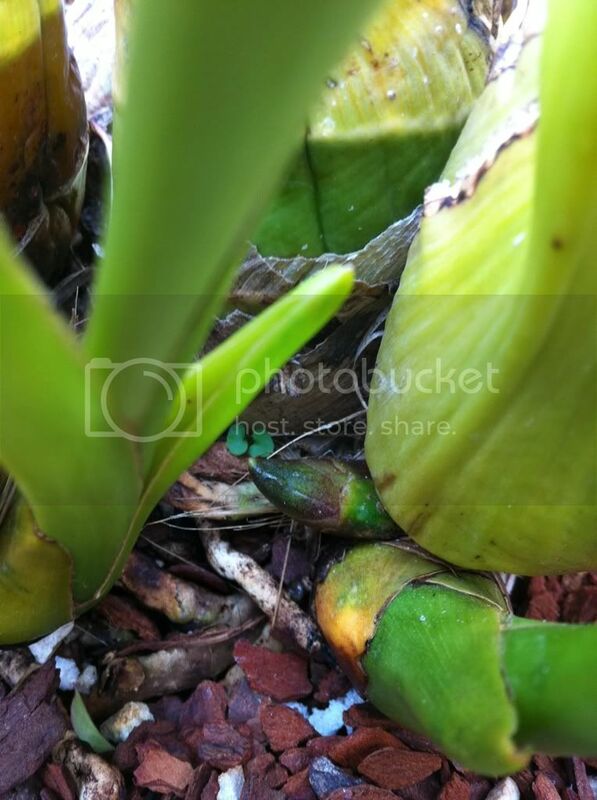 One plant will have a healthy spike and another spike on the same plant could be rotten. Any ideas on how I can stop that?? It's not that cold - maybe 14 degrees at night and they're under cover (on the balcony) but it's still very humid. 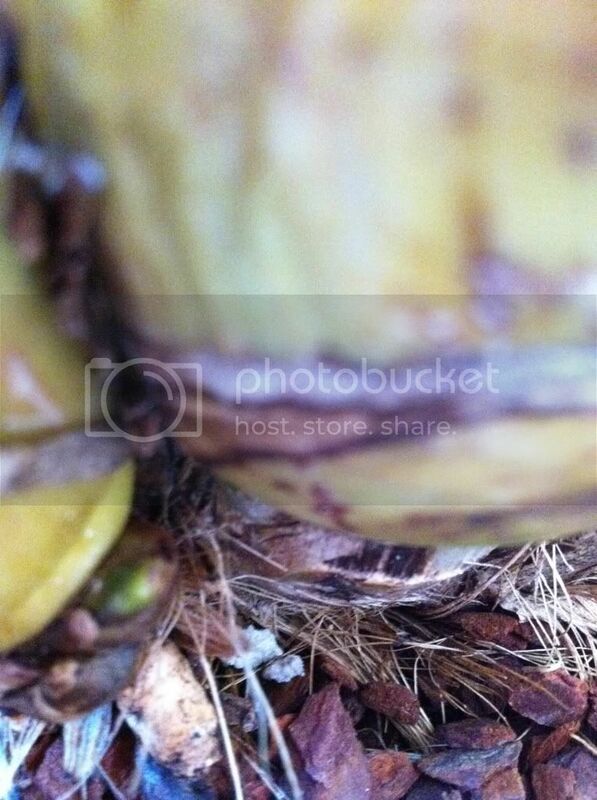 The photos are all spikes, you can see the definite roundness in the first one. with the 3 rd pic is that the one you think mat be rotten ? the spike on the right ? I don't think it is rotten if thats the spike you are referring to. No, on the right I have 2 very healthy spikes coming through. The rotten ones I have removed!! (I hope that won't affect the bulb) They grow to be about 5cm long and then they stop and turn into a more yellow green, and when I gently peel the protective tissue, the inside is just brown and damp. It doesn't really have the bad fungal smell, but they are rotten none the less. I've treated all my plants with Yeats Anti Rot a few times since Feb at 6-weekly intervals. PS. it's probably a stupid question, but there are 3 buds on the middle spike, it that it or are there going to be more flowers? thats not really a stupid question you may get another spike as I had a few cyms last year that put out a second set of spikes. I have some nail scissors and tiny metal forceps when I remove the sheath, I've only done it on the spikes that I suspected to be rotting and unfortunately they were all rotten. 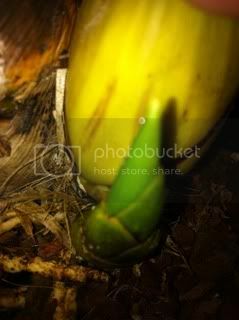 One small plant had 3 spikes, one of them is going great (buds pushed through the sheaths) and the other 2 have rotted. Wouldn've been great to have all three and I hope there is some simple way of fixing my problem! I also know alot of orchid growers that water by hand when there cyms are in spike. that is for 2 reasons number one so the spikes don't rot and number two is so that there is no damage due to watering may cause on the buds or flowers as the growers that i know here all show there orchids. I only water by hand too, my balcony does not receive rainwater. I always to take care to avoid watering the spikes and shoots. I'm thinking that the humidity we're experiencing is a little high for the air temperature and the ratio is off. At the moment it's 93% humidity and 17 degrees!! It's quite breezy and there's great air movement but it's must not be enough. It's been like this for 2 weeks! are you able to set up a fan to keep a steady air flow ? My apartment is quite high up and there's always a breeze and their leaves are always moving. I assumed that's enough air flow! Our shocking weather is due to break tomorrow, maybe my later bloomers will come through unscathed. 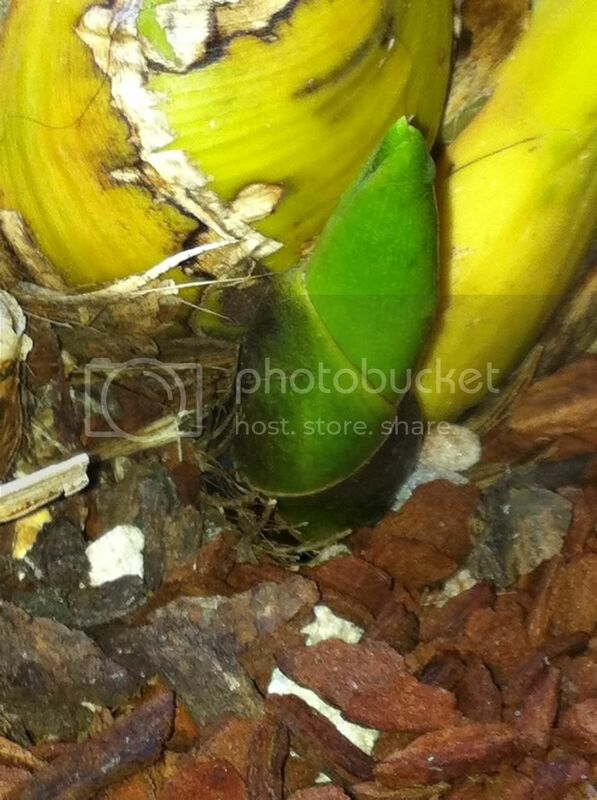 I've also noticed if you gently squeeze a flower spike you can feel the buds inside. Mine should be bursting open any day now. (I know I've said that before) I guess beauty just take time to get here. Along with the sqeeze test.. I've noticed that once the spike gets growing.. It's more identifyible because it looks like it has like a husk around it. 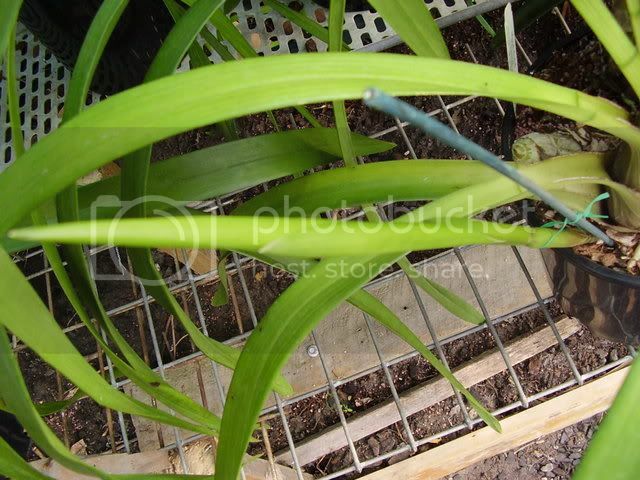 Where as normal new growth of cymbidium does not. But this happens only after the spike has reached a certain stage.. Like lets say about 2 to 3 inches of growth. 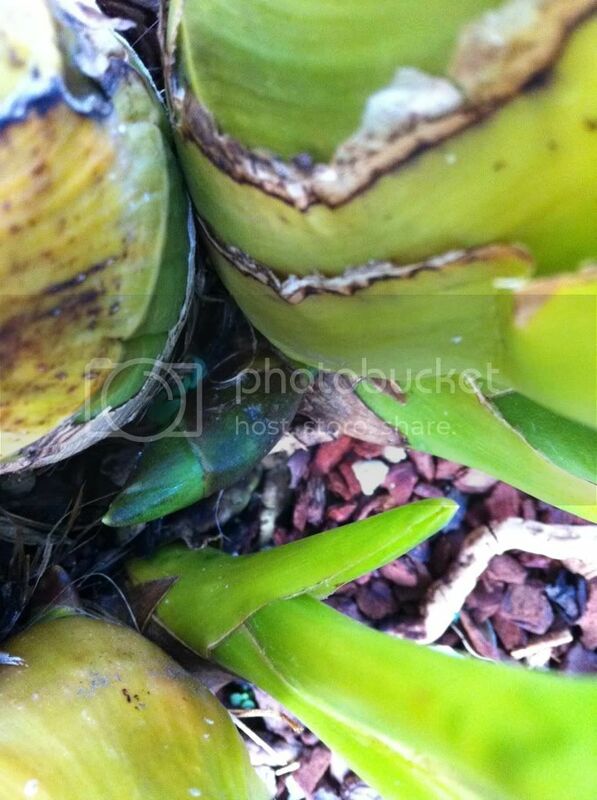 Another thing is that the ants love new flower spikes as soon as they come up. The spikes no matter how small.. Put off a natural sugar that naturally draws ants and keeps them growing freely..
Don't run any more tests. The data do not support my conclusions!!! Jerry, that was the same freeze that killed all my intermediate orchids. Good thing all the cyms. survived with just a few leaves that got frost damage. That was some crazy weather. hope we don't have a repeat anytime soon. 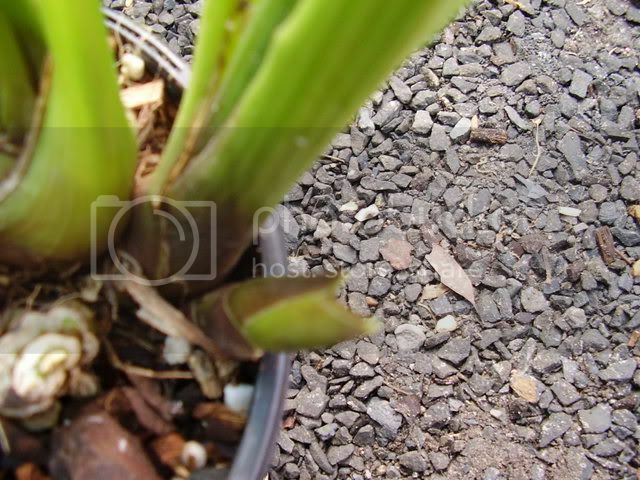 Just go to AOS | Members Only Area and get a cymbidium culture sheet. By the way, orchid hybrid names are capitalized. They need a month or so of cooler temps then they'll start spiking. We've had approximately that here in Melbourne Australia and just yesterday I found new spikes on 4 of my cymbidiums. I know this is an older post, but I seem to have gotten myself confused. 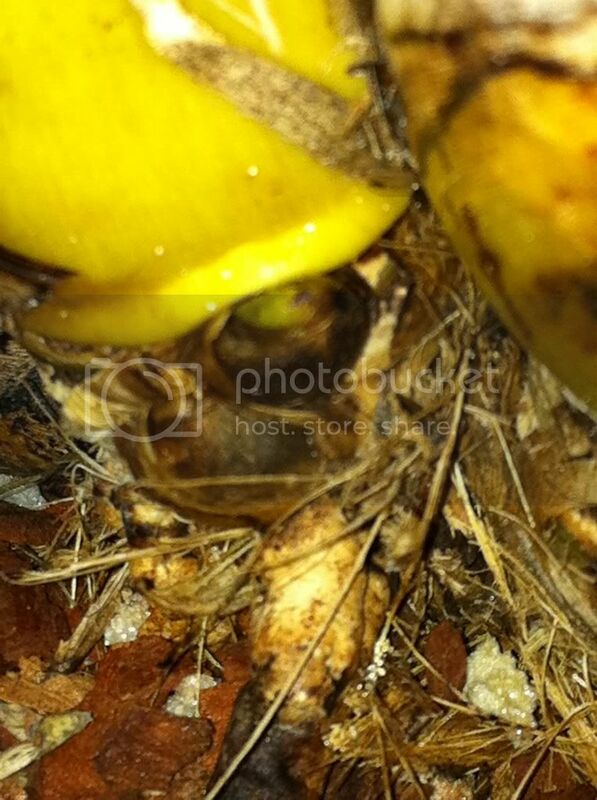 What I have on one of my NOID Cyms are two growths on two separate pbulbs facing each other. They look different from each other - one is really plump with what appears to be armor-looking wrapping all along the bottom. The other one is much slimmer with less of the armor. I got this from a friend earlier this year, and its my first cym. and all its done so far, is just sit there in my shadehouse and do nothing, so today when i went in and had a closer look at all my plants, i was so excited to see this...... thing, growing near the front of the plant, and i was just wondering what everyone's opinion was as to whether it was a growth or spike, both would be GREAT. 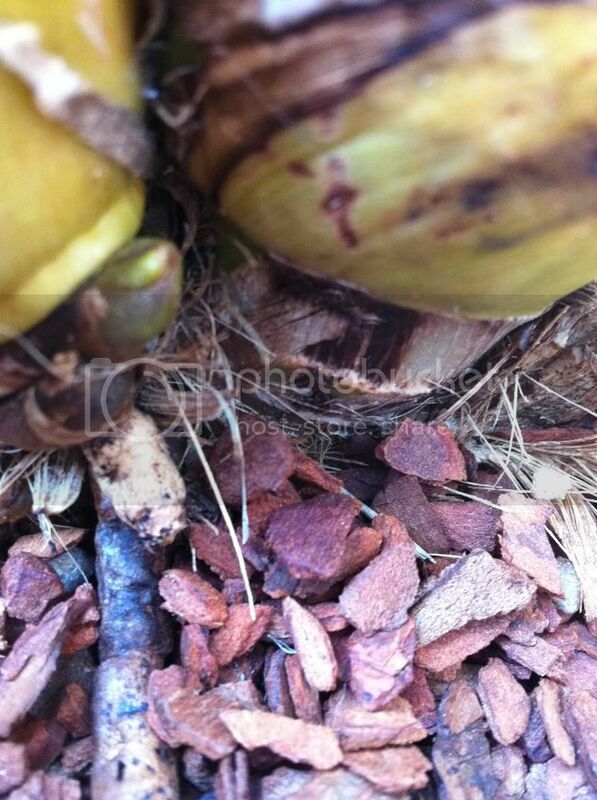 Last edited by pikkumyy; 08-06-2011 at 10:18 AM. Reason: added p.s. To me from 2 Cyms.I have these are new growth? so does anyone have any ideas??? That could very well be a spike as it looks more rounded than flat like a growth. So just keep an eye on it and keep us posted. Hi Michael. The tip looks pointed to me- I'll say new growth. Since I am pretty much hyper-vigilant about all of my orchids, I thought I would try to track a couple of growths on my NOID Cym. They look very different to me, so here goes. 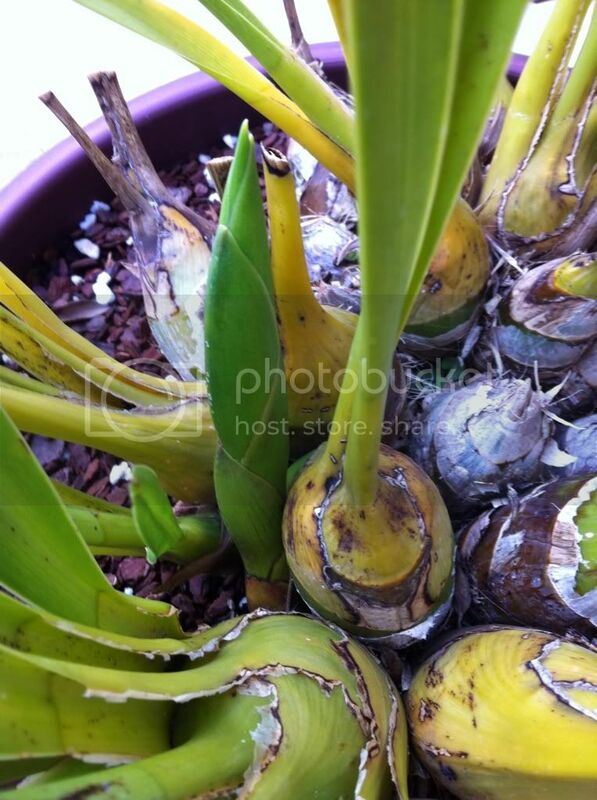 The first one is on what appears to be a mature, but newer p'bulb at the 'back' of the pot. This growth appears to be rounded on top, which I haven't seen before. 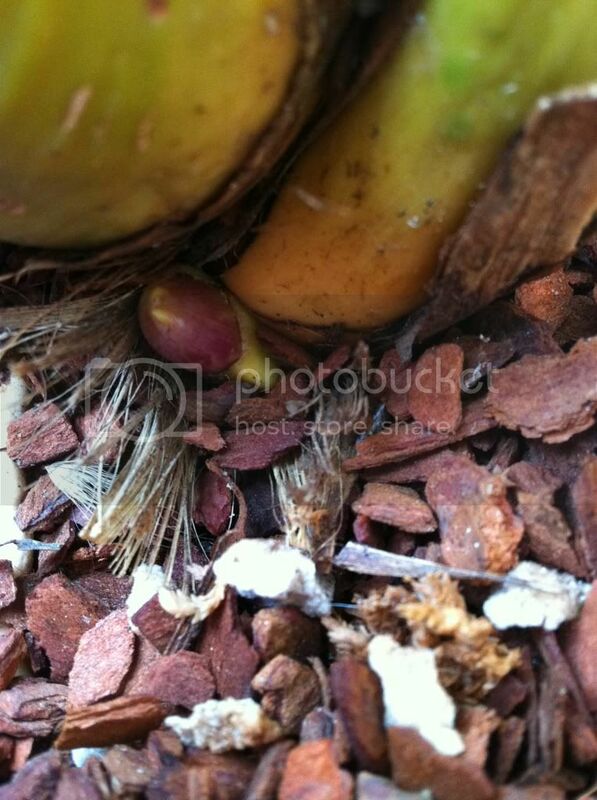 The next pics are of other growths that are becoming familiar. They appear to be pointed on top. Others that have started out this way have grown up to be new growths. So, there they are. I will follow up next month to note progress. A lot of posts around the 'net have growths starting at 3-4 inches. Since some of us look a little too close sometimes I thought this would be interesting to follow. When leaves are that green the plants will not bloom unless you give them more light. Cyms need to have more light than they can get inside a house and the leaves should be a light almost yellow green. Put them outside in the spring in 50/50 sun as soon as all danger of frost is past (gradually acclimate), and bring them in as the fall frosts start. Cyms are hardier than you think and can take up to 8 hours at 28 degrees F. before serious damage occurs. Buds and spikes are more tender and I do not recommend taking them much below freezing but they can take it for several hours. In the "spike or growth" question, at 2-3 inches in length, in my experience, spikes generally are rounder in form, feel soft at the tip and do not "fan out". Last edited by Cym Ladye; 08-23-2011 at 01:37 PM. Dorothy Stockstill 'Forgotten Fruit' is considered a Novelty sized Cymbidium (smaller plant and flower size). It is grown like other cyms but as it blooms a bit later in the season, it tends so send up its growth later too. It is a rapid grower, however, and soon catches up! Your spikes may not show until late winter. Hopefully you have had it outside in good light during the summer. Thanks I have had it in full sun for months, now moved it in green house with some shad.Looks good but no blooms yet?Thanks. 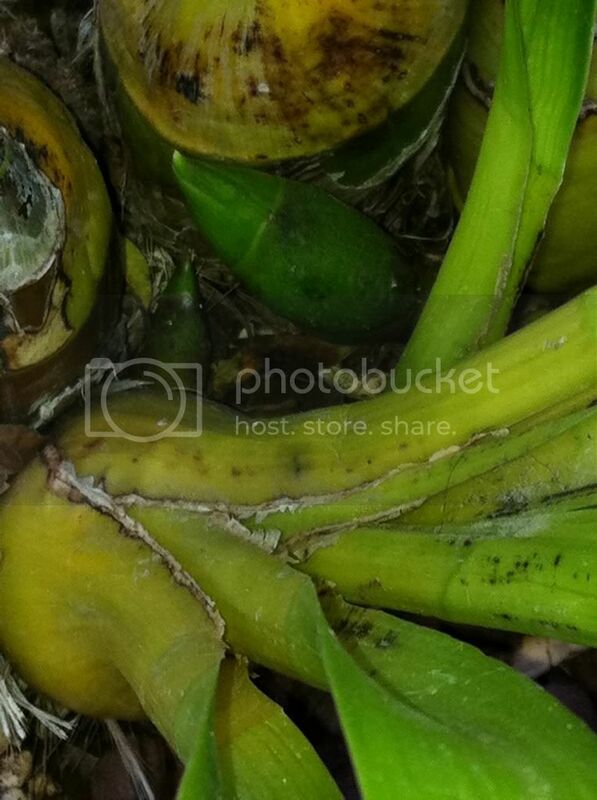 Here's my cymbidium, with new growths. I guess that in the second picture it is clear which is a new pbulb and which is a spike. Or not? Last edited by gabi_borza; 09-09-2011 at 05:26 AM. OK. It hasn't been a month yet, but there has been enough growth that I thought I could post. The second one is outgrowing the other two, and I gave it the tiniest squeeze and it felt a little flexible. I am almost willing to say it is a spike, but will hold off until I see flowers! 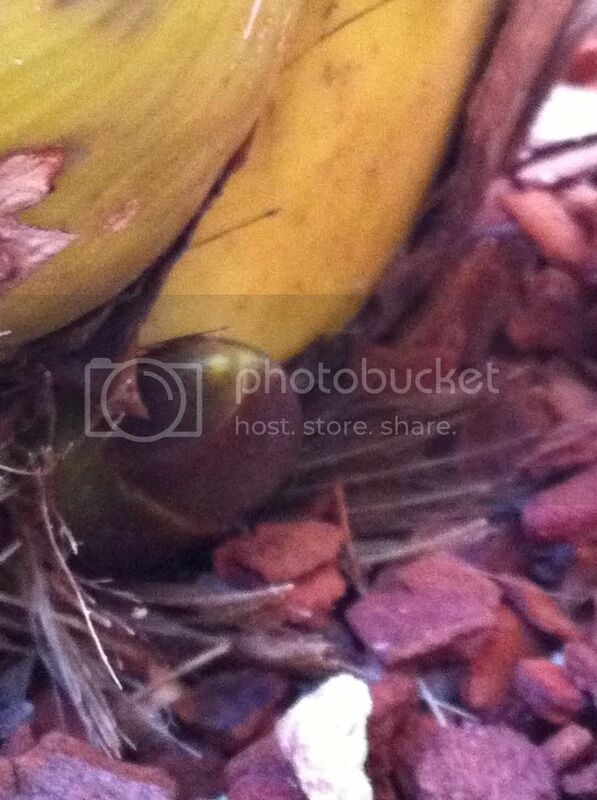 Another thing I am noticing is that with the other new growths that have come out, they seem to "hug" the p'bulb. The second one has been growing almost horizontally. Haven't seen that before...yet. "Aut viam inveniam aut faciam - I will either find a way, or make one"
Here are the new photos int he same order as before. I am pretty confident in the second one being a flower spike. The first one is still up in the air, and the last one isn't really growing much. You can't tell from the photo, but this one is 4-5 inches long now. It has outgrown the other ones by a mile! Oh, and the p'bulb on that last one is not that yellow. I forgot to turn off the flash..
OK. The first two are both spikes, and if you look closely at #2, there is a little one coming along, too. It is also a spike. The third one has done nothing, so I won't post it anymore. I do have a question, I use 14-14-14 slow release pellets, what should I give it now? Do you know of any Cymb culture sheets that are good? I like the picture this is such a superb information about these flowers. It look like so beautiful. I have a first spike on an un-bloomed Cym. 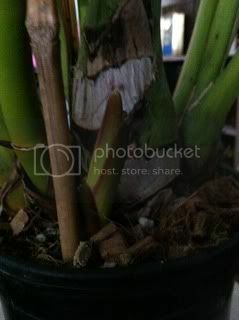 I've got four new growths on my Cymbidium I don't know if they are flower spikes or new growths, they all look the same! Hi best of luck with the spikes / new growth, as many have said in this site, for the newer growers and some of us more experienced growers, sometimes it not easy until the new growth / flower spike gets to arouind 4 to 6 inches long and by then you usually can tell by the fatness of the head its a flower spike were as new growth tends to be more elongated and skinny. Hi most tend to be very generic or basic, when I started to grow Cymbidiums back before computers I read a very good by by J.N. Rentoul called Growing Orchids, book one (1) Cymbidiums and slippers. 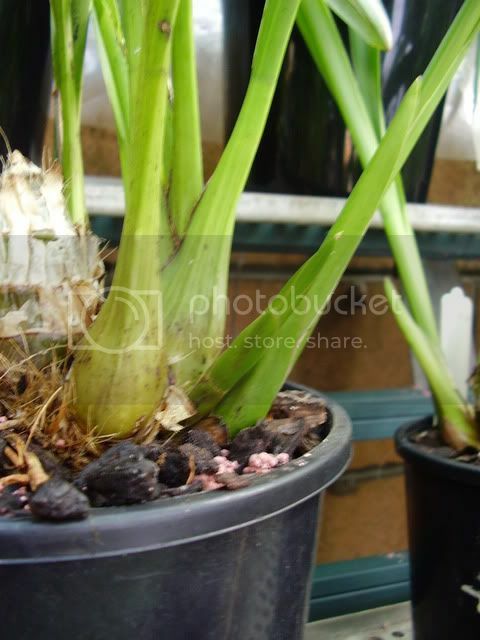 As now we have computters and google, I looked at as many Cymbidium nursery as possible and look at thier culture sheets and worked it out from there, you will see many funny ideas and some very good idears to work with. 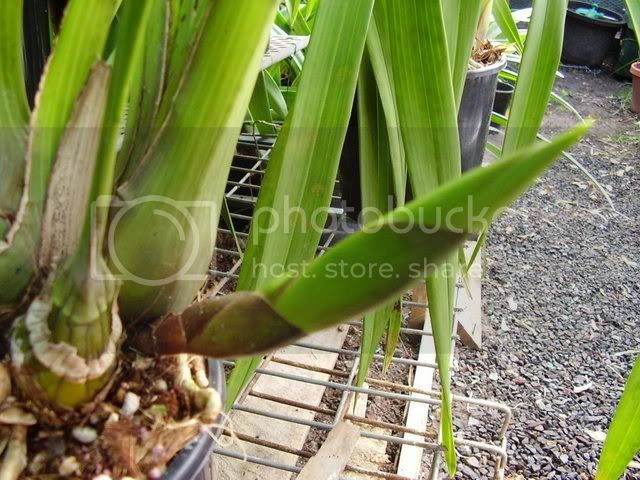 Lots of good info on this site as well, you may have to search a lot for pages put up buy some of the Cymbidium growers! I had another good look after posting this last night, I know that one of them is definitely new growth. I was hoping that they were all flower spikes but now I think they might all be leaves!